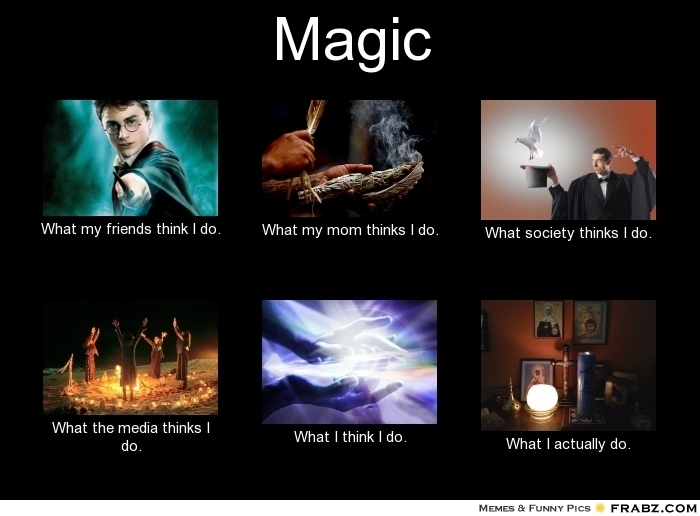 The meme above reflects my experience when talking to others about “what I do” when I say I practice magic. Thanks to films like Harry Potter and The Craft, society has a very distorted view of what this ancient art entails. My Mom is starting to catch on and even asked me to do a smudging in front of her house after a bicyclist was hit by a car [Thankfully he lived to cycle another day!] However, she doesn’t really press me for more details! She thinks of me more as a healer, which is mainly what I do, but she would never call me a Christian witch, which is what I am. So, what is magic? It is an art that is practiced in many spiritual traditions such as Wicca, Druidism, Native American spirituality, Christianity, Judaism, and many more. It is also practiced by some with no spiritual component to it at all. If you spend any time reading books or trolling the internet, you’re likely to discover a myriad of definitions regarding what magic is, some of which are just plain ridiculous. Are there any universal traits to magic that tie together all those who practice the Craft? To be honest, I’m not really sure there is. If I’ve learned anything for my Wiccan friends, it’s that you do whatever works for you. There are no hard and fast rules, just lots of experimentation and failure until you find those tools that are most effective. If there is anything we have in common, I believe it is working with these three energies to affect change in the world around us. We may use different tools and techniques to get the job done, but the heart of magic has to do with raising and sending energy. This requires learning how to focus our will and make our intention clearly known to the Universe. Adelina St. Clair in The Path of a Christian Witch states this very well: “As I tried to synthesize all that I learned about magic, it became apparent that basic magical theory is extremely simple. Yet its true application is worthy of the greatest spiritual masters. Magic has two major components: The Will and the Word.” Will, in its simplest terms, means how passionately we want our goal to be achieved. Word has to do with how we make that request known to the Universe. If I’ve learned anything about the Craft, it is that all the tools, techniques and spells we use will be ineffective if we cannot master both Will and Word. Some people spend too much time worrying if they have the right color candle or possess the perfect spell to get the job done. If we are unable to learn to ground, center ourselves, and focus solely on our magical goal without other distractions getting in the way, our magic will always be weak and ineffective. So, I’d love to hear from you on this subject! What does magic mean to you? Is there anything that ties all of us magical people together? Inquiring minds want to know! This entry was posted in Magic and tagged Christian, Magic, Pagan, the Craft, Wicca. Bookmark the permalink.